Pure Sensia review | What Hi-Fi? For all that we bang on about sound and/or picture performance being the most important aspect of anything we review, we're not so blinkered as to think there aren't other, sometimes less tangible, qualities to be considered. That's emphatically the case with the Pure Sensia. The Sensia is, on one level, simply another inexpensive internet radio designed to see service in the bedroom or kitchen. But then again, the way the Sensia operates, and the features and facilities it incorporates (or hopes to incorporate), means the sound it makes can't be considered the be-all and end-all. Simply in terms of specification, the Sensia's a very intriguing proposition. 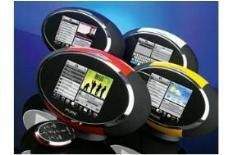 The rugby-ball-shaped unit (available in red, yellow, white and black, and each with a matching remote control) is home to wireless internet radio, DAB and FM radios too, two 3-inch full-range speakers and a claimed 30W of power. Then there's the input for an MP3 player or Pure's i-10 iPod dock, mains or rechargeable ChargePak battery operation, and wireless streaming of most audio codecs via a UPnP (Universal Plug and Play)- equipped server or computer. The real attention-grabber, though, is the 14.5cm full-colour capacitive touchscreen that serves as the Sensia's control interface. It offers access to apps like Twitter (well, access to an app, which is Twitter, though Pure is promising a new app every month for the forseeable future) and it makes every other bedside device look about as up-to-the-minute as a top-loading VCR. As far as sound goes, the Sensia is as poised and coherent as this type of product gets. There's a rather vague quality to the soundstage it presents – perhaps a by-product of the position of the loudspeakers inside the cabinet – but in all other respects it's thoroughly enjoyable. The frequency range is nicely balanced, with none of the low-frequency bluster or top-end stridency that less-capable designs are fond of, and there's good clarity and bite to the midrange. Speech-heavy broadcasts sound both intimate and immediate, and music charges along with something approaching gusto. The Sensia's touchscreen interface is a slightly more qualified success. At the time of writing, it's a slightly awkward, less satisfying take on Apple's iPhone scoll, swipe and tap system – Pure is promising weekly upgrades (via wi-fi, naturally) in an effort to deliver a little more slickness and predictability. In principle it's far more logical, attractive and simple to use than the more common dot-matrix controls that we're all familiar with, but until the screen is a little more fluent, it's just a little bit frustrating. In short, the Pure Sensia is an exciting, thoroughly up-to-date interpretation of the bedside clock radio. Its bright, colourful control layout is likely to win as many hearts and minds as its unflustered, balanced sound. Once all the promised upgrades are in place, it should function as effectively as a social networking tool as it does as a music-making device.